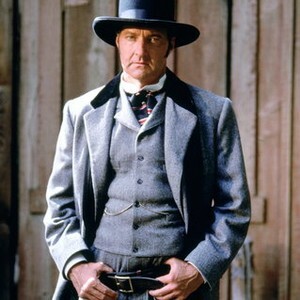 Anyone in the room who knows that Randy Quaid played “Doc” Holliday please raise your hands and take a seat at the front of the class, Mike’s Take 101. 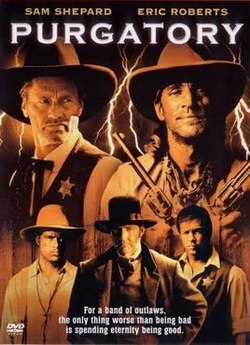 Along with Quaid as the famed gunslinger is Sam Shephard as Wild Bill Hickock and Donnie Wahlberg as Billy the Kid in this made for cable effort via TNT that is one of those rare westerns that mixes fantasy into the genre. Generally it’s done with mixed results but I think Purgatory comes out in the upper half of titles that attempted to do so. 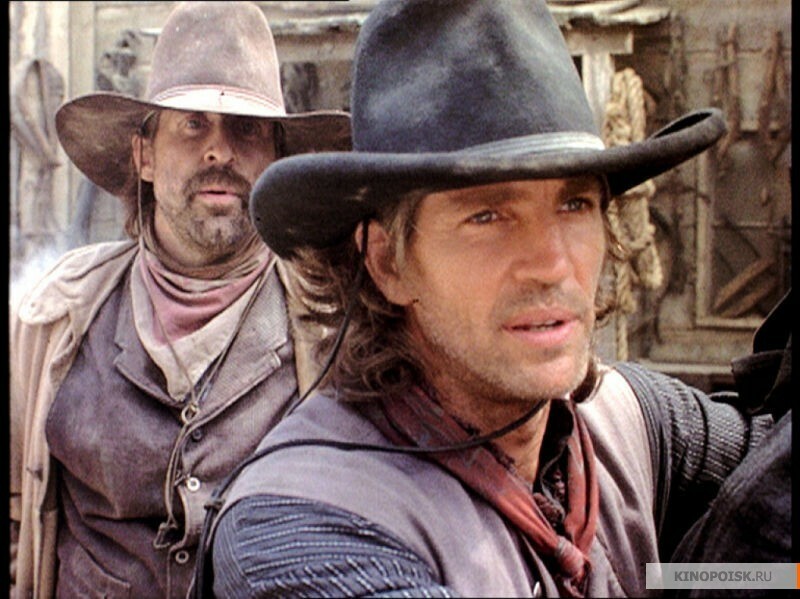 In Wild Bunch like fashion, a gang of outlaws ride into a frontier town led by Eric Roberts and Peter Stormare with the local bank being there destination. Hardened Stormare has brought along his nephew, Brad Rowe, who is left stationed outside. Rowe is a youngster caught up in the mythical west and regularly reads the dime store novels that tell of the famous gunfighters who blazed the trail with guns and the women who made the saloons their home. The gang are aggressive once inside the bank and things are looking good till a troop of Union soldiers ride into town sparking an explosive gunfight that sees director Uli Edel give it his best attempt at a Peckinpah styled shootout. Leaving many dead men behind the gang rides out of town into the desert with a posse hot on their trail. As if they pass through a magical canyon, they will find themselves in a land of green and a town called Refuge. It’s an isolated place with no contact to the outside world. No telegraphs and a peaceful sheriff played by Shepard who doesn’t carry a gun. The town Doctor/Quaid sees to the wounded who have rode in and the townsfolk are hospitable to Roberts and his outlaw horde. When western favorite R.G. Armstrong drives the stagecoach into Refuge a beautiful woman gets off the stage that young Rowe recognizes as a woman who was just killed in the gunfight that the gang just fled from. Something is amiss in Refuge and it’s almost cult like when the townsfolk all head to the church at the end of main street. Shepard and Roberts are going to verbally spar over the good will of the town versus Roberts keeping his men in line. 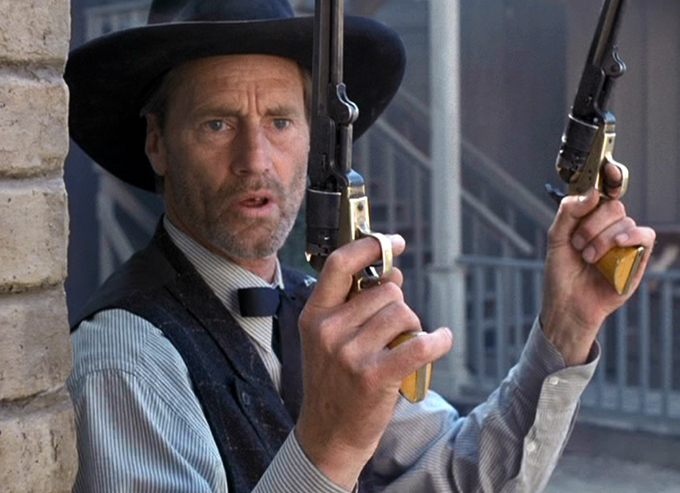 Mainly Stormare who has a taste for the town’s fine ladies. Thanks to those novels, Rowe is going to piece together the true identities of many people in town. 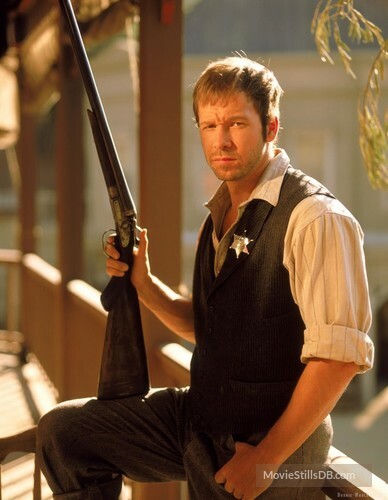 Aside from Shepard, Quaid and Wahlberg, doesn’t that store keeper look just like Jesse James? Stormare and Roberts aren’t too happy with the soft hearted Rowe and when things are about to get violent, Rowe will find himself standing up to his former gang to protect those who made their names with a gun but who now seem to be passive and cowardly. What’s still to come is an O.K. Corral like showdown and a fitting, colorful end to our two main protagonists at the hands of a western Grim Reaper. “The Creator may be tough but he ain’t blind.” says the wise old R.G. 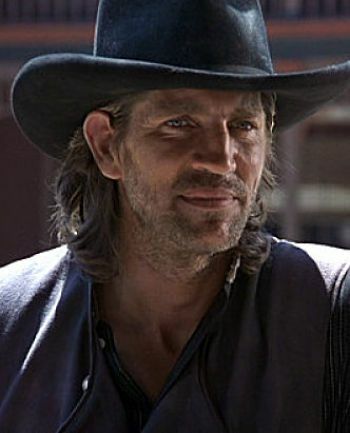 who made this his final appearance in a western. Cable movie this may be but it’s got a solid roster of names who surprisingly fit quite nicely into the western genre. I say this mainly in reference to Roberts and Stormare. I wouldn’t have thought to cast them in this proving once again that I know little as to what an actor can pull off on camera. Eric makes for a mean spirited outlaw leader and Stormare who has long been a scene stealing favorite of mine does just that here with the same eye catching characterizations he’s known for. From the Coen flicks to his Russian Cosmonaut in Armeggeddon to proving he should have been the central villain in the recent John Wick 2, my attention always perks up when I know he’s going to be in a film I’ve sat down to watch. With a bit of research I found a piece of trivia I’d like to share. The credited writer, Gordon Dawson, actually goes back to the days of Peckinpah. He worked as a wardrobe supervisor on The Wild Bunch and moved up to an associate producer credit on The Getaway, Cable Hogue and Alfredo Garcia which he also wrote. Now I know where that Wild Bunch feel came from. And where does Quaid fit in when compared to the many others who played Doc? There’s little flash so think of it this way, we’ll always have his Cousin Eddie to recall. Never heard of this one, but it seems like an intriguing concept. And J.D. Souther as Jesse James? I own a few of his records! So now I’ve learned something. Didn’t know the actor playing was james was a singer or didn’t make the connection. Kind of a fun flick if given the chance. Watched! Love Eric Roberts and Sam Shepard! They both do quite well in this one. yes I’m a big Peter Stormare fan too, especially as you point out, his brilliant role in Armageddon. 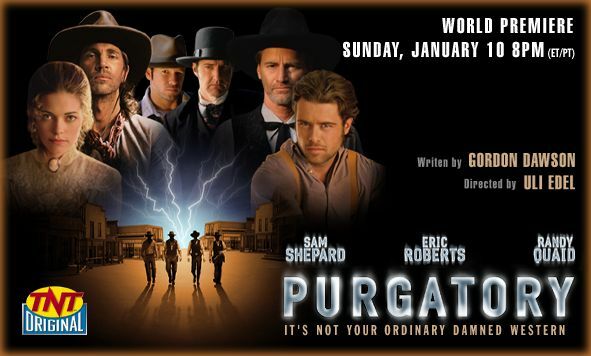 Purgatory looks good fun and what a great cast. Will keep my eyes peeled for it. He’s a cool dude on screen. I’m a big fan of Lebowski and of course he’s in the and yes love his Russian in the space adventure. For me he stole John Wick 2 and I was disappointed he wasn’t the main villain. TNT in the 1990’s had some excellent western and historical movies. This was one of the good ones for sure. Nice review, Mike! Yes I would wait for the movies t turn up on VHS or DVD cause we didn’t get the station but I’d see ads for the movies in magazines and it drove me crazy that I had to wait to see them. Thanks and drop in anytime.